Yummy, this sounds like your favourite dish. The Fish’n Chixx is derived from Spiders famous 70’s Fish formed into a modern fish shape without compromises. 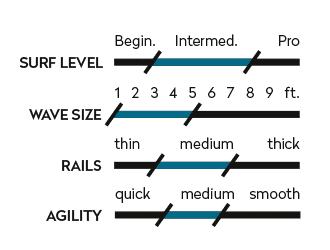 You can surf it about 2 inches shorter than your regular shortboard. Smooth turns, clearing flat sections and catching every damn wave are the Fish’n Chixx strong suits. These characteristics don’t interfere with its ability to rip some fishy turns once the swell is right. The sizes up to 5’8 perform amazingly on riverwaves, especially on the weaker ones. That’s why we equipped those sizes with our triple rail layer glassing to make them extra tough. It features a slight bull nose with a touch of vee to hide volume and increase your paddle speed. The low entry rocker helps to catch waves and ensures the river abilities. The bottom is formed with a single to double concave leading into the classic fish tail.